We offer early bird discounts for participants booking 45 days or more before the start of a course. Registration fees (minus administration costs of £100 + additional credit card charges if applicable) will be refunded to participants who contact us in writing or via email to Anne Gresham postmarked no less than 1 month before part 1 of the training begins. No refunds will be made thereafter. The place may be deferred to the following training, but no refund will be made in case of cancellation for the deferred training. A colleague may be substituted on the part 1 at no extra charge if we are notified at least two business days before the training. If for any reason a person has attended the part 1 but is unable to attend the part 2, we will offer substitute dates and locations, but no refunds will be made. All payments must be received at least 10 working days before the course start date. We know we are not perfect. But we aim to be. That is why we have a complaints procedure. Sometimes we can put things right; sometimes we can only explain ourselves and apologise. But we do want to learn from our mistakes. What you tell us helps to improve our service to you. We will treat your complaint confidentially, seriously and quickly. You may request a copy of our complaints procedures at any time. Let us know if you are unhappy and give us a chance to put things right. If you are not satisfied, the next step is to make a formal complaint by writing or emailing us explaining what went wrong. You can find our contact details here. Radically Open Ltd makes no warranties, express or implied, as to any matter whatsoever, without limitation, condition, originality, or accuracy of research, translations, or any invention(s), instruction(s) or product(s), whether tangible or intangible, conceived, discovered, or developed for or under this agreement; or the ownership, merchantability, or fitness for a particular purpose of the research, instruction or any such invention or product. Radically Open Ltd will not be liable for any direct, consequential, or other damages suffered by clinicians or patients, any licensee, or any others resulting from the use of the research, translations, instruction, consultation or any such invention or product. 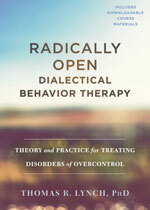 Radically Open Ltd makes no representation or warranty regarding actual or potential infringement of patents, copyrights or other intellectual property or third parties, and clinicians and patients acknowledge that the avoidance of such infringement in the use of the products, processes, instruction and translated materials related to this research and instruction will remain the responsibility of clinicians and patients. Clinicians receiving training and consultation as part of this agreement shall continue to be fully and solely responsible for the care, evaluation, and therapy of its patients. Any training and consultation services provided by Radically Open Ltdare not intended as clinical supervision and such consultation does not replace the clinical judgment, responsibilities and/or supervisory responsibilities and requirements of the clinicians receiving training and consultations, nor their employees.